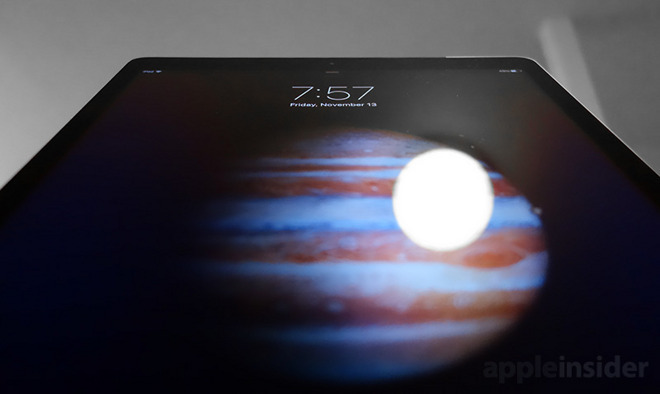 In a research note obtained by AppleInsider, KGI Securities analyst Ming-Chi Kuo says Apple is seeing less than satisfactory output of iPad Pro's massive 12.9-inch display, the tablet's main draw. Kuo says Sharp is currently the sole supplier for Pro's high-resolution screen, though Samsung is expected to lend a hand before the end of 2015. As many iPad Pro buyers are well aware, Apple Pencil was in strictly limited supply at launch, with current ship-by times pegged at four- to five-weeks. Confirming industry whispers, Kuo says assembly of the complex device is not going as smoothly as planned. He expects Pencil yields to improve as producers overcome inefficiencies associated with building a new format device. As for unit sales, iPad Pro is off to a decent start with Apple moving 2.4 million to 2.6 million copies to close out 2015. Moving into next year, Kuo expects shipments to decline 10 percent to 2.1 million to 2.3 million units. He notes, however, that the forecasted dip is the smallest out of Apple's entire product lineup. Finally, Kuo breaks down supply chain allotments, noting TSMC is manufacturing all A9X processors. Radiant is supplying 100 percent of iPad Pro's backlight modules, Parade is the lone display timing controller supplier and GIS accounts for 75 percent of all touch module and LCM assemblies. Longtime partner Foxconn is once again taking lead on putting all the pieces together.